You probably heard the latest scary pregnancy news by now – a new study suggests cell phone radiation during pregnancy may put your child at risk for behavioral disorders like ADHD later. We reported on the study and so did just about every othernews outlet around. But while moms-to-be may now be freaking out about their cell phone use, I think the research study is getting blown out of proportion a bit. I’m 17 weeks pregnant and even though I love my iPhone and sit in front of my computer using wifi all day, I’m not worried. Keep reading to find out why this Yale study might not be as dramatic as everyone is making it out to be, and what I’m doing to protect my developing baby from the potential dangers of ionizing radiation from cell phones and wifi. First of all, the Yale School of Medicine research study linking cell phone radiation during pregnancy to ADHD and other behavioral disorders in kids was done on mice. As you may have noticed, mice are very different from humans. Mice are much smaller than humans, so the dose of radiation they were administered from an active cell phone (they didn’t use mice-sized cell phones by the way!) could likely have a larger affect on their tiny bodies than the same would on humans’ larger bodies. Not to mention the gestation period of mice is 19 to 21 days, just a fraction of the 280 days humans are pregnant.The active cell phone was set on a permanent call above the mice’s cage for 17 days – almost the entire time of the rodent’s pregnancy. According to a New Scientist article, some experts agree that this study should be looked at more cautiously. Eric Taylor, a child psychiatrist from the Institute of Psychiatry at King’s College London, says that “much more care” is needed when extrapolating directly from mice to humans. He adds that the radiation dose in the experiment was large, and the “researchers’ tests of animal memory should not be directly equated to human attention [because] different species can react differently”. He also said the rate of ADHD problems has actually been steady for more than 20 years and any increase is most likely due to greater recognition of the disorder, not an increase in cell phone use during pregnancy. The Yale researchers say it would be sensible for pregnant women to limit their baby’s exposure to mobile phones. Will I change my habits during my pregnancy? Well, I’m certainly not going to put my phone on a permanent call and set it on my bump for 17 days, but I don’t actually spend too many minutes a day talking or tinkering on my cell phone any way. I don’t think I’ll cut back from my normal mobile phone routine, but there are a couple of things I’m already doing to protect my baby-to-be. 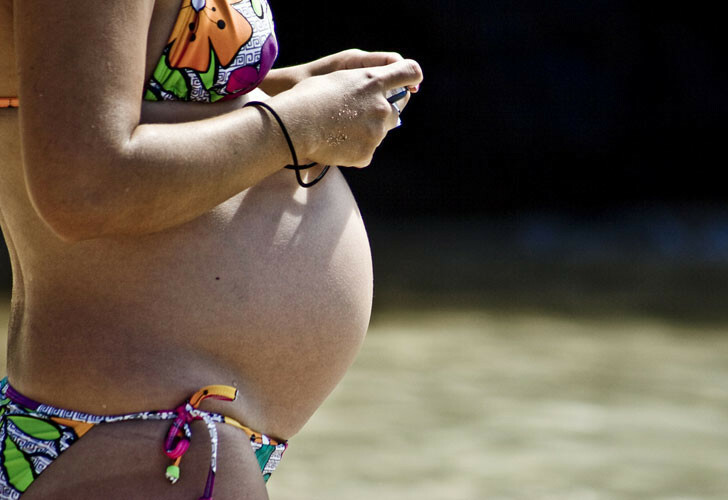 Is cell phone radiation dangerous to your unborn baby? Maybe, maybe not, but Pong iPhone cases will protect you either way. Founded by a team of PhDs from Princeton, Harvard, UCLA and MIT, Pong Research Inc, has developed iPhone, iPad, Android and BlackBerry cases that have been proven in FCC-certified labs to protect consumers significantly (up to 95% below FCC limits) from wireless device radiation. The cases are designed to redirect and redistribute the cell phone radiation that would otherwise be absorbed by your head, body or God forbid, bump. Pong cases are well designed and compete in aesthetics and usability with any of the other top iPhone cases on the market. 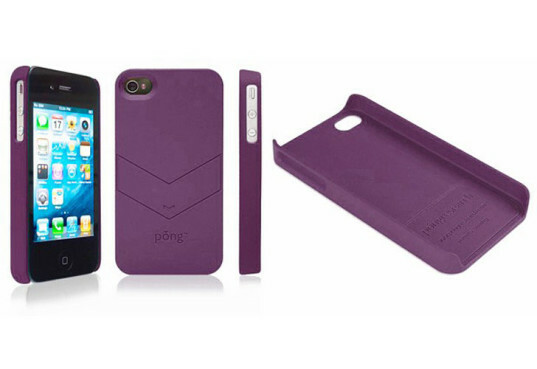 I’ve had Pong cases on my last two phones and love them – pregnant or not. Better safe than sorry. Like a Pong phone case reduces radiation coming from your cell phone, the Belly Armor Belly Band Embrace promises to shield your bump from ionizing radiation from cell phones, laptop computers and more. Belly Armor was independently tested in FCC-certified and NVLAP-accredited labs to verify 99.9% shielding effectiveness across a range of everyday radiation. How does it do it? The Belly Band Embrace is lined with special RadiaShield Fabric, which includes a highly conductive silver textile that the company says offers the same protection as a 1/4-inch thick sheet of aluminum, in turn canceling out any radiation from cell phones or wi-fi that comes by your bump. Belly Armor even offers of a fun science experiment-like test in which you wrap your cell phone in the belly band and after 30 seconds the signal will disappear. It’s true. I saw it happen. Am I totally convinced that I need this belly band to protect my baby-to-be? Well, no. But as I’ve been saying, I’d rather be safe than sorry. Plus, I was going to buy a belly band to extend the life of my pants anyway, so why not go with this one that may have added benefits? While the belly band isn’t organic – it’s made from Nylon and Spandex RadiaShield Fabric – it is free of heavy metals and other toxins. And in case you’re wondering if the Belly Armor belly band can protect your bump from TSA backscatter machines at the airport – the answer is no. It doesn’t shield you from ionizing radiation like X-rays. Your best line of defense at the airport? Plan ahead so you’ll have enough time to request a pat down at airport security rather than walking through the backscatter machine. Even though the TSA says backscatter machines are safe, and scientists confirm the doses of ionizing radiation are indeed very small, you always hear reports of doctors who refuse to walk through them and there are some times in your life when it’s better to be extra safe than sorry (as I keep saying). Did I start using Belly Armour and Pong because of this new study linking pregnancy cell phone radiation and ADHD in offspring? No! I had a Pong case long before getting pregnant and I take these precautions because I’m well aware that there’s a lot we don’t know about cell phone radiation and ionizing radiation in general. After all, the World Health Organization has linked cell phones to cancer. And for every study that says cell phones are perfectly safe, there is another one that shows something scary such as kids’ brains absorb twice as much cell phone radiation as adult brains. Until we know for sure, I’m happy to take easy precautions to ensure my safety and the safety of my baby-to-be. You probably heard the latest scary pregnancy news by now - a new study suggests�cell phone radiation during pregnancy may put your child at risk for behavioral disorders like ADHD later. We reported on the study and so did just about every othernews outlet around. But while moms-to-be may now be freaking out about their cell phone use, I think the research study is getting blown out of proportion a bit. I'm 17 weeks pregnant and even though I love my iPhone and sit in front of my computer using wifi all day, I'm not worried. Keep reading to find out why this Yale study might not be as dramatic as everyone is making it out to be, and what I'm doing to protect my developing baby from the potential dangers of ionizing radiation from cell phones and wifi.